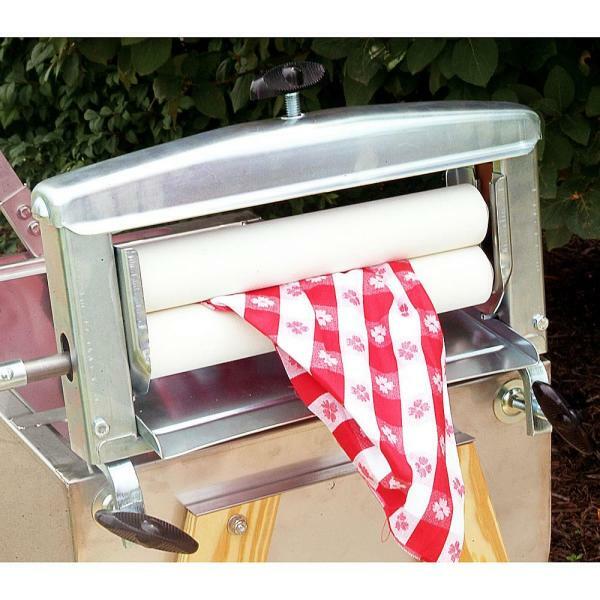 Save money and time with our hand clothes wringer. This manual wringer gently squeezes water from all types of fabrics without using damaging heat. It's the only hand-turned wringer available, and even when other models were available, it has always been the highest quality. Pair this with our Lehman's hand clothes washer and you'll be all set! Our manual clothes wringer removes up to twice as much water as a spin dry! Note: If you are buying our washer and our rinse tubs, we recommend getting two wringers. This allows you to keep one on the washing machine for soapy water and one on the rinse tubs for clean water. I expected better from You people, clamps that hold it on spread apart, loose all over, works well on wash cloths and socks but sweat pants are a big problem, definitely not worth $200.. I have been using this machine with the crank for over 30 years. My Dad bought it at a garage sale ro wash his vegetable in...but, I needed something to do the laundry when my electric washing machine quit. I was amazed with the fact that it cleaned my laundry cleaner than the electric one did. I have another new machine now, but always keep the hand one close...I still use it for emergencies...(electricity goes out) or when one of our children or Grandkids need this to use...of which, it is going out again for our daughter to use again...! It does need a new crank system...the old one has done a wonderful job, but the rollers have cracked,, handle got losts somewhere along the years (we use pliers) and tge top screw part is broken too. So, am saving up for a new top...in the mean time, we'll get couple of channel locks for her to get her and her daughter's laundry done. At least I know where to get one now!!!! So thankful I found you are still making these! I was skeptical and worried about ordering this wringer because of the bad reviews. But I have to say my wringer works just fine. Does what its supposed to and seems to be put together fine. So I think the issues that people had with it in the past have been corrected. I ordered the washer and wringer at the same time. The washer came and the wringer finally came separately about a week later. I love both the washer and wringer. They both do the jobs I expected them to do and do them very well. I have to say that I was worried about how the wringer would work after reading a lot of the reviews. But for me the wringer and the washer do a great job. MY WRINGER ARRIVED TODAY . . . IT WOULD HAVE BEEN OK, EXCEPT THE ROLLERS WERE NOT 12 INCHES WIDE - THEY WERE BARELY 11 INCHES. OH WELL . . . RETURNING IT. I wish I could give it zero stars, but that isn't an option. We bought it to laundry on our boat because we live on it about five months a year, and laundry facilities are expensive, and inconvenient. When the wringer arrived, I thought Wow! This thing is not very well made. I'm sure it is a piece of junk made in China! We keep trying to use it, but it takes both of us to use it, and another set of hands would sure help. I would throw it overboard, but I have toooooo much money in this thing, and I don't want to pollute. Please don't waste your money! I was excited to find Lehman's on the web, but now I'm afraid to purchase anything else from them. Lehman's says: I'm sorry that you were unhappy with your wringer. If anything like this ever happens again, please remember that we guarantee your satisfaction. We are happy to make it right! I do need to let you know that this is the opposite of Chinese made...it's USA made from USA components by a family owned business in Pennsylvania. The quality (as pointed out in other reviews) has usually been very high. It's been the same proven design since the 1960's. You didn't mention any specific complaints, except for one thing, which you are right about...it works best with two people, except for smaller clothing items and garage chamois. I purchased this along with the Lehmans Own Hand Washer (you can read my review of it on that products page) which the washer is still working great. This is my second purchase of this wringer. The first one I bought several years ago and it was quality and a work horse! For this new purchase, I was sent a defective wringer: it was missing the wood blocks inside so the metal shafts of the rollers and the handle were cutting into the frame. It created rust, and sharp metal bits that ruined a brand new robe and some towels - I sent lehmans photos of the metal shafts and damage. I sent back the defective one and they sent a replacement. I have had the replacement for almost a month, and while it has the necessary wood blocks/spacers, they are misaligned and now the wringer is doing the exact same thing as the defective one - the shafts are being cut into making metal bits everywhere on the rollers and drain tray. Somewhere along the line the quality (or quality control) of this wringer was lost. I cannot recommend it. I only wish I could get my money back. This one is going to the local metal scrap yard. An expensive thing to throw away, but it's useless and ruins clothes. Please Lehmans, double check your wringers before they get sent out. Lehman's says: I'm sorry you were disappointed with your wringer. Your precise explanation of the problem you encountered has allowed us to fix it with the factory. Our owner personally talked to the owner of the factory and they are making the following changes: 1) They have been making these for over 50 years. They have decades of experience and will make sure that their most experienced craftsmen are on future production runs. 2) Every wringer made from here on out will be hand tested, at the factory, before it ships. 3) They replaced the tooling and jigs used to make the wooden blocks to prevent the misalignment problem. If you have one that doesn't work, please don't throw it away or give up. We have all the common parts. If you need to replace broken or worn parts, we can take care of it for you. By the way: These are the last and only hand wringer made. It's USA made, by a family owned company, using the same design for over 50 years. We bought the wringer and washer set and have done two loads so far. When attached to the washer they sell, it is pretty sturdy. This only moved around when we got to the waist of jeans or bigger items if we didn't hold it in place a little bit. Yes it makes a squeaking/groaning noise, but that is probably due to the tension of the rollers pressing together. It does squeeze a lot of water out of the clothes, but I find 2 passes at least does the best with everything to remove water. Jeans will be pretty wet due to their shape and the seams not being on the same level as the material. Just be patient and enjoy the process. It does what it's supposed to do. Is it the best?! This is the first one I've ever used, so I can't say for sure. It does get the job done though. We own a spa and make hot towels for the treatments. We make 100+ towels a day. My staff was complaining all the time about making towels (hot water, hard wringing them out, etc.) I bought this and attached it to our utility sink. We use hand towels folded in thirds. I put one edge in hot water then put it in the wringer, spray it down with hot water and it drops into a bin on the other side. Once it's done it's the perfect dampness (no drips at all) and rolls up so nice and neat for the towel warmer. I can make about 30 towels in 15 minutes, saving us at least 1.5 hours a day. I did have to teach my staff how to use it. Nobody had ever seen a wringer before! They would put them through backwards and hold one end up to keep it from getting wet, then wring by hand again! It had me laughing. My mom had an open tub washing machine in the back yard that agitated the clothes in soapy water. We'd open the drain then fill it with clean water then run the clothes through the wringer and hang out to dry. When I was 5 we got a real washing machine but my mom kept her wringer because the clothes dried faster after she'd wring them. Thanks for offering this great product! 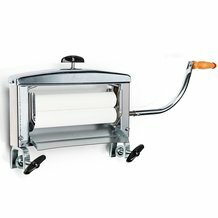 Once you attach it to a sturdy frame, this wringer works wonderfully for light clothes, dish towels, wash clothes and diapers. I haven't had any problems with thick cuffs or heavier knits, but you must be careful with fragile fabrics... it's better to do two passes than feed it through once tighter. Jeans can be done feet first, but release the wringer when you get to the waist/pockets since the rivets and button can be damaged by or do damage to the wringer. If you're strong, you *can* wring heavy bath towels and thinner twin-sized blankets as long as you fold them accordion-style (about 12 wide) before feeding them into the wringer. This does require significant arm strength or modifying the crank with a longer vertical bar. And you really must have this attached to something extremely sturdy and stable. I have mine on a 2x4 that's attached between my porch posts with a basin underneath. You will not be able to feed a thick quilt or queen-sized blanket through this winger, once you fold it to fit through the narrow bars, it will be too thick to fit in the rollers even if they are fully open. You'll do better to buy an area rug wringer with wider rollers if you wash large/thick quilts, blankets and comforters often. I didn't have the twin tub set up and the wringer stands are too expensive. I just used an old kitchen chair and attached the wringer to the back of it. I place my knee on the seat to steady it when wringing an item through. I have one of those large plastic tubs on the floor behind the chair to catch the water. It really does a great job pulling out the excess water. I have a tough time with jeans though. I use mine with a Wonderwash. Those who claimed it was unsteady may want to do what I did and use an old kitchen chair for a wringer stand. This system requires us to select at least one lamp, but if it didn't I'd give zero. I was very disappointed in this product. Straight out of the box I asked myself, What makes this worth $190? But it was easy to put together (even though there was one missing bolt washer). It attached easily and well to my washtub. However, it makes an unpleasant noise when it's cranked, it does not dry the clothes--any adjustment that allows the clothing to pass through is too loose to squeeze water. I can do better by hand. Somewhat disappointed in the performance of what is supposed to be your best wringer. First off, we had to build a wooden stand to attach to the galvanized tub stand so the wringer would be stable. The clamps of the wringer land too close to the rounded corners of the tubs and it won't clamp properly. Secondly, the top roller was stuck and would not move when we tried to use it. Someone took it home and found that the holes where the roller is connected were too tight and he fixed that and lubed it and then it rolls much better. We are a water ski team and bought the set to wring and wash costumes after a show. Unfortunately, the wringer does not wring out as much water as we had hoped for, but does get some out. We will be looking into getting something to spin the costumes drier and use these to wash and rinse our costumes. I love this... it gets my clothes wrung out enough so that they will actually dry in a reasonable amount of time. Yes, it makes the wash tub wobble and even the wringer itself wobbles a bit, but sometimes things are a little harder than if it had been electric. It's a little tough to run thick things through as well, but it can be done. I run sheets through it and towels... Around the handle gets rusty, so that's a problem. And the reason I'm writing this review is that I just ran a brand new, freshly sewn skirt through it and the edge of the washer ripped a HUGE hole in the fabric(quality fabric too), so just be careful when running things through it!!! Carefully lead it through and don't let it get too close to the edges! I was so excited to get this, and so disappointed once I did. This wringer seems to be designed with the least possible mechanical advantage. The handle is far too long horizontally, but not long enough vertically. And while they SHOW it attached to an aluminum wash basin, it is way too top heavy to use unless that washtub is CEMENTED into the ground. I can barely turn the crank with NOTHING going through the rollers, and add a towel it becomes impossible. This is with the top tension screw totally removed, not just loosened. This is their best? I'm wondering if I just got a bad one, and I'm hoping Lehman's refunds my money. Do not consider this unless you have a solidly mounted wash tub. It does not work well with large buckets (I have a 13 gallon bucket) and it works even less well with my aluminum wash tub, similar to the ones pictured. I'm guessing those are bolted to the floor. If you're thinking of a car wash, this is probably not what you want. The towels my husband and I managed to crank through were no drier than when we hand wrung them.